For the roller coaster, see Codonas Amusement Park. For The Cleveland Show episode, see Crazy Train (The Cleveland Show). The song's main guitar riff has been praised for its use of the full minor scale. It reached No. 49 on the United Kingdom singles chart and No. 9 on the Billboard Top Tracks chart in 1981. The master ringtone was certified double platinum and had by September 2010 sold 1,750,000 downloads. The song is one of Osbourne's most well known and recognizable as a solo performer. It was rated 9th greatest guitar solo ever by readers of Guitar World magazine. The song was also ranked 9th by VH1 on the list of the 40 Greatest Metal Songs and in 2009 it was named the 23rd greatest hard rock song of all time also by VH1, the highest placement by a solo artist on the list. The Flys, on the soundtrack Universal Soldier: The Return. Pat Boone covered the song on his 1997 "In a Metal Mood: No More Mr. Nice Guy" album. "Undead" by Hollywood Undead (in a different key). "Let's Go" by Trick Daddy. This song featured in the films Ghost Rider Megamind and in TV shows The Office and The Simpsons. The parts of the musical instruments are sung a cappella by children, followed by the entire family singing lyrics, in a 2011 TV commercial for the Honda Pilot. It was used as a theme song of Comedy Central Roast of Charlie Sheen. The Westboro Baptist Church spoofed the song by rewriting it for an anti-gay protest outside the U.S. Supreme Court in 2010. In response, Osbourne issued a statement saying, "I am sickened and disgusted by the use of 'Crazy Train' to promote messages of hate and evil by a 'church'." The church also announced plans to perform their version of the song while protesting the funeral of Slayer guitarist Jeff Hanneman in May 2013. The song is a playable track in the video game Rock Band 3. Tom Morello and Serj Tankian covered the song for the tribute album Immortal Randy Rhoads: The Ultimate Tribute, which was released in the spring of 2015. ↑ Kajzer, Jackie; Lotring, Roger (2010). Full Metal Jackie Certified: The 50 Most Influential Metal Songs of the '80s. Course Technology. p. 43. ISBN 978-1-4354-5441-5. ↑ Huey, Steve. "allmusic". AllMusic. Retrieved 2010-04-16. 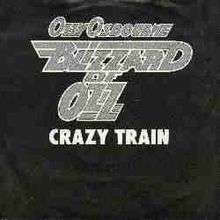 ↑ "AllMusic Billboard Blizzard of Ozz". Retrieved February 7, 2009. ↑ "Yahoo Music". new.music.yahoo.com. Retrieved 2016-07-05. 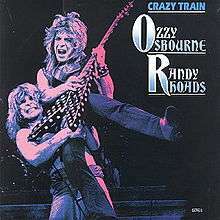 ↑ "Crazy Train by Ozzy Osbourne Songfacts". Songfacts.com. Retrieved 2010-04-16. ↑ "100 Greatest Guitar Solos - Tablature for the greatest guitar solos of all time". Guitar.about.com. 2009-11-02. Retrieved 2010-04-16. ↑ "Original TV Shows, Reality TV Shows". VH1. 2016-09-30. Retrieved 2016-10-16. ↑ "spreadit.org music". Archived from the original on February 12, 2009. Retrieved February 7, 2009. ↑ "Universal Soldier II [Television Soundtrack]". AllMusic. Retrieved 16 October 2009. ↑ Miller, Nancy (10 May 2002). "Mighty Neighborly". Entertainment Weekly (653). Retrieved 8 July 2013. ↑ "AllMusic song credits "Undead"". Retrieved 15 June 2009. ↑ "AllMusic album review Thug Matrimony: Married to the Streets". Retrieved 17 June 2009. ↑ "Soundtracks for Ghost Rider". Internet Movie Database. Retrieved 2009-08-03. ↑ "Ozzy's 'Crazy Train' Fuels New Honda Car Commercial". RTT News. 2011-10-07. Retrieved 2011-10-13. ↑ "Roast of Charlie Sheen - Full and Uncensored". The Comedy Network. Archived from the original on 2013-06-27. Retrieved 2013-07-05. ↑ "Ozzy Osbourne 'disgusted' by Kansas church for using his song during anti-gay protest". Daily News. New York. Retrieved 9 October 2010. ↑ "Westboro Baptist Church plan protest at Slayer guitarist Jeff Hanneman's funeral". NME. 2013-05-06. Retrieved 2013-12-08. ↑ "This is the full 83-track Rock Band 3 setlist". Engadget. Retrieved 2016-07-05. ↑ "Tom Morello And Serj Tankian Release 'Crazy Train' Cover". Bloody Disgusting. 2013-05-06. Retrieved 2013-12-08.